Over at F1 Fanatic, Keith Collantine has been running a poll to find the best driver in the wet. All the usual culprits are mentioned and debated, the eternal war between the Alonso and Hamilton camps re-ignited, the Kimi fans defending their hero's latest results, new boys like Kubica and Vettel reaping plenty of votes. It's a great free-for-all and the comments are well worth a read. I voted for Hamilton, based on his amazing superiority at some wet races this year and last and excusing those where he made mistakes. But, as I was reading through the statistics presented by commenters to support their claims, I realized that there was a driver who shone whatever the conditions, monsoon, wet, damp and drying. It was Mr Consistency himself, the man who is never noticed, Nick Heidfeld, perhaps a contender for most under-rated driver of all. Of course, I understand why Quick Nick so often goes unremarked; he is unassuming, sensible and quiet, definitely not the sort that the media seek out for a sensational comment or two. You might think that those involved in the sport would be more aware of his qualities, but no, twice in his career he has seen beaten team mates promoted to better teams ahead of him. It must be the beard. In the wet, Nick's statistics show him to be the best bet to finish and gain points. Others may win but they also fall off the track occasionally. Not our Nick - he will get the car home somehow, often beating his highly-rated team mate, Robert Kubica, in the process. And it is this reliability that has given Nick two records and a share of another. Of the current drivers, he has the most races under his belt without a win. And he has also scored the most championship points without ever standing on the top step of the podium. Those may seem dubious records to own but, when one considers the machinery he has had to drive, they speak of utterly dependable consistency. He may not have done so yet, but he obviously understands that, to finish first, first you have to finish. His shared record is more widely known: he is currently equal with Michael Schumacher's mark of the longest unbroken number of finishes - 24. If he brings the car home in Singapore, that record will be his alone. Obviously, this is a testament to the incredible reliability of modern F1 cars but it must also say something about a driver's mechanical sympathy and ability to stay out of trouble. Both are important weapons in a driver's armory. Nick's place at BMW has been under considerable pressure this year, with Kubica's emergence as one of the stars of tomorrow and the possibility of the team taking on Alonso in 2009. But lately he has been matching his team mate, once again showing that, if Robert is quick, Nick is no slower. And that applies in both the wet and the dry; Heidfeld is good in all conditions. As for Alonso, it seems that he has opted to stay at Renault next year. I cannot help but feel that this is best for all concerned and especially for Heidfeld. As a double world champion, Alonso has clearly tempted BMW but I suspect that Heidfeld will be better for the team in the long run. Next year the cars will be very different and I hear already the guesses that this driver will thrive on the changes, another will not. And, as one of the smooth stylists, Nick is slated to be less effective in the slick tire, less downforce world of tomorrow. At which point I must shrug and ask how we rated Massa's chances without traction control and in the wet. Sometimes things just don't go to plan, do they? ...and he's also the driver with the most second placed finishes and no wins. But I agree, Heidfeld is under-rated. He almost has the sort of unobtrusive personality that makes him prone to being overlooked. But apart from a few problems earlier this year - which he now seems to be on top of - he's been very impressive in recent years. All the same, he does seem to belong in that B-bracket of drivers. There's nothing that marks him out as as Alonso/Hamilton/Raikkonen. I had no idea he had that many consecutive finishes. I am surprised this has not been discussed on the ITV coverage. I guess he was unfortunate that he equalled the record the same day Vettel won and we had all the stuff that went with a mixed up wet race. Keith: That's an ominous statistic, the most second place finishes. Reminds me too much of Chris Amon. Interesting that you say he's a B-bracket driver, without that special something that marks out the Alonsos and Hamiltons. Isn't that why we doubt Massa? And isn't he in with a chance of being champion this year? Steven: SpeedTV over here made quite a thing of Heidfeld equalling Schumacher's record. I think they mentioned it even at Spa and, before the Moza GP started, they were wondering whether he'd do it. Admittedly it did get forgotten once Vettel had won but that is understandable. These days I can watch ITV's coverage as well as SpeedTV's (thanks to various naughty work-arounds on the computer) and I prefer the American commentary team. The downside is that Speed has more ads - but they always catch us up with anything that has happened after the break. It is noticeable that Speed is about 30 seconds behind ITV's coverage - obviously a time delay inserted and I wonder if ITV also has a time delay but a shorter one. Is there any such thing as a truly live broadcast anymore? Steven Roy! Why did you post the link? :O Look, it's gone now! Clive, we heard when Rubens Barrichello broke the races-competed record, and he's merely Button's team-mate (noting that Button is currently less pressworthy in the British press than Coulthard because he's not retiring at the end of the season). Thanks for the head`s up on Heidfeld in the next race,I`ll be keeping an eye on him now.It`s right what you say about him,when I think Heidfeld my mind goes blank,but you know what they say"Walk quietly,but carry a big stick".If Max and Bernie do happen to read this I would like to say what a fine and upstanding pair of Gentlemen they are,and do not look forward to the day when their Mothership comes to collect them. 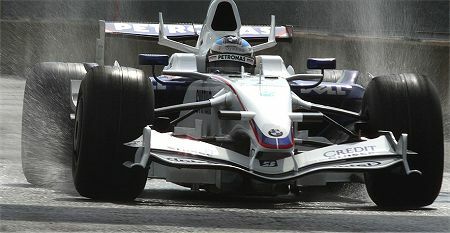 I would argue that Heidfeld is not pushing as hard in the wet as he is not fighting for a very tight world championship. I wonder how he would do if he were in Lewis' position. That said, it is still impressive when compared to his similarly placed teammate. Lewis is also a full on Race driver. Schumacher, Mansell, Senna, Alonso and Raikonen have all messed up every now and then as they push as hard as they can and are therefore running their cars to the very edge of what can be achieved.